"Covering High-Ranked Market Leaders for More Than 20 Years"
After a solid up day yesterday, U.S. stock futures are flat this morning. European markets opened up, while stocks in Asia ended lower. Hong Kong’s Hang Seng shed -0.3% after slipping into bear market territory on Tuesday. I ran my routine stock screens early this morning, yet did not find any new stocks to add to our watch list. 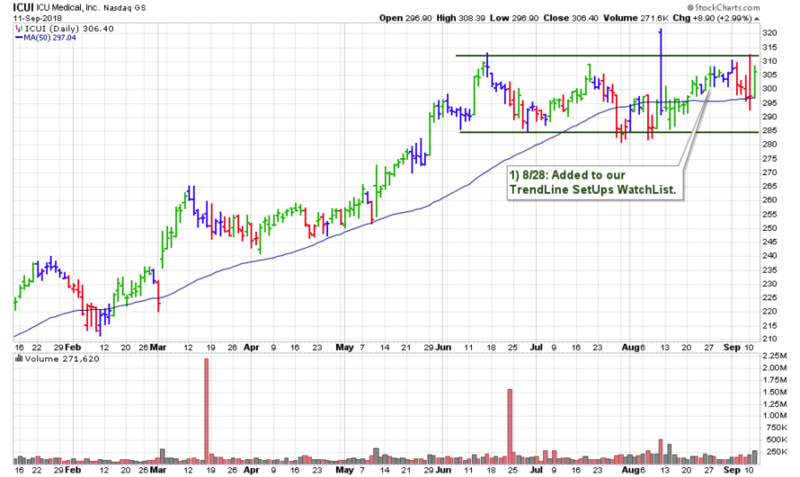 We still have a lucky 13 stocks which we will be watching for the next buyable breakout – see here. One stock in particular is Medical-Products Leader ICUI which traded +3% higher with a +66% increase in volume yesterday and is nearing its TRIGGER PRICE. Chart courtesy of stockcharts.com – Click chart to enlarge. Current Portfolio Members can access all watch lists with updated trading criteria including – TRIGGER PRICE, TRIGGER VOLUME, and MAX BUY PRICE for every stock here. Missed any of these morning reports? You can find all previous reports here. As always, if anyone has any questions – please feel free to email me at james@jamestaulman.com as I would be glad to assist you. Looking for a Like-Minded Professional Who Manages Money ? …and everything that is included with a membership.